I'm thinking in investing in a couple of payware aircraft. I'm thinking of the A2A Civilian Mustang (Are the regular mustang repaints cross compatible?) and I really want a later model Spit (Mk V or later) The Recent Dunkirk and others I've seen are the early Marks. The A2A Mustang is good, as are the various Warbirdsim examples (I would say they are as good as each other). For Spitfires....The JustFlight MkV is good, the best Spit out there is the RealAir MkIX and MkXIV, but I dont think they are available from anywhere these days. Repaints for the A2A military P-51 can be installed on the civilian version. There are some people who argue for a small texture tweak - I can't remember what it is because I've never bothered with it, just copied over the textures and the aircraft.cfg entries and everything looks good to my (discerning but not fanatical) eye. The A2A Mustangs are very involving and of course give you all the system depth and persistence of their Accu-Sim module (separate purchase for the P-51, but the same Accu-Sim module works for both military and civilian versions, so there's some value to be had if you ever want to buy both. However - while you're shopping, don't overlook the Warbirdsim P-51 packages, which are really a labor of love - with better physical modeling than the A2A, down to very specific details of individual aircraft, and lots of variants in each set. They're also easier on the system than the A2A, which makes for very fluid performance that gives an excellent feel of flight. I'm sure there are respects in which the Accu-Sim flight model is more detailed, but to me the gain in raw performance can be worth it. Take a serious look at Warbirdsim. 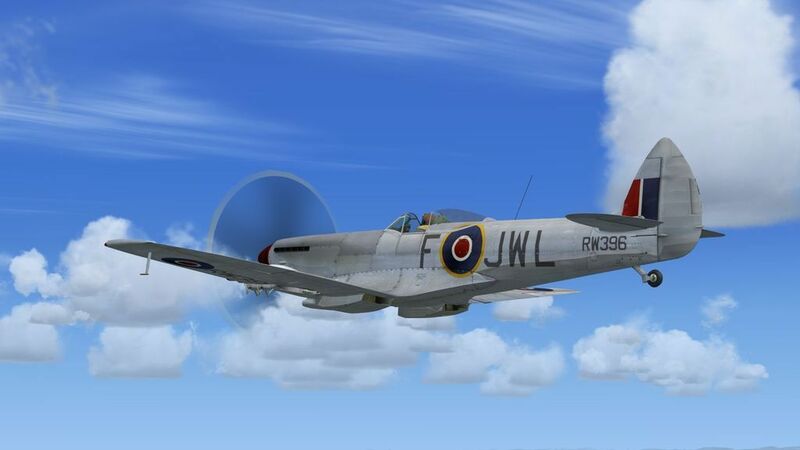 About the Spitfire Mark V - I could be wrong, but I think the only option out there is JustFlight's. I don't own it, so can't comment. Perhaps others can (and also correct me if I've inadvertently missed somebody else's Mark V). "Ah, Paula, they are firing at me..."
I have both the RealAir Spitfire IX's and XIV's as well as the WarBirdsim P-51D Mustangs. Both types were very well done by their respective creators. Unfortunately RealAir Simulations shutdown sales just as I was buying mine. Just looking through the file library here and I see significantly more repaints for the Warbird Sim 'Stangs than for the A2A versions. I have the A2A/Aircraft Factory P/F-51H and I do love it but I want a decent D/K model as well. As for the Spit's I may have to settle for an earlier Spit version that is still available. The two best Spitfires at the moment, in my book, are the A2A Accu-Sim Spitfire I/II pack and the new JF/AH Dunkirk Spitfire. The only V available is JF/AH and RAS was by far the best IX/XIV. You may still find box sets of the RAS Spitfires available - I think Flight1 were the distributor? If so, I doubt they sell them through their own store any more, but things like Amazon may well still have links to copies. Mustangs? I have and fly the A2A Accu-Sim P-15D and the Civilian Mustang, although I rarely if ever use the Civilian one. I also have a bunch of Warbirdsim ones and really like the early model WBS Mustangs. That's more swings and roundabouts, although I much prefer Accu-Sim for making you think about what you are doing, because it will break if you do things badly wrong. IMO, get the Accu-Sim ones for both, because of the fact that you need to look after them properly. ...and my airfields to fly them out of, because I'm biased as a biased thing with a bias, that's only ever seen on biased media. Edited to add: Check Avsim and OZx for A2A repaints, or the A2A forum. There's absolutely no shortage of repaints at all! The best late model spit by far imho, and it works perfectly in P3D4! As for the P-51D, there is indeed the A2A version and the Warbirdsim packages. I had both until my move to P3D, but the A2A one does not work there (yet), and may require a new buy for that version. The Wbs one works fine. A2A has the systems depth with their accusim, but WBS wins it easily in the looks and the number of different versions. Every single version of the D is available I think, including a whole series of one offs. Check carefully which one to buy, the choice is endless. I did a ton of repaints for both, still painting the wbs birds occasionally, so you will be spoilt for choice there. In the end you can't go wrong really, both are excellent. A2A has a bit more systems depth, WBS the better looks and versions. I am down to the latter now in p3d, but to be honest, I don't miss the A2A bird too much, so if and when it arrives for p3d, I don't think I'll buy it again. A few years ago, I got both Mustangs - the A2A civilian version and one of the WarBird Sim packages - the A2A lasted approximately 1/2 hour and I still have / and fly the Warbird Sim one !! I only have the A2A Mustang and Spitfire, both are excellent, the civilian and military repaints are interchangeable. I would suggest you check the repaints at www.aussiex.org they seem to have more repaints than anyone else for the A2A planes. This is the Plane Design Mk. XVI as a port-over from FS9. It's more of a challenge to fly in FSXA than the others already mentioned, but it does fill the gap for a bubble top Spit... if you don't mind dealing with the typical prop and exterior glass issues. I have tried just about all of them. For Spits, the RealAir is great but now unavailable, I would get the new JF Dunkirk or even the earlier Battle of Britain variants. For Mustangs I would get the Warbird Sim versions, sometimes you can get a real deal here. I have tried the A2A models and was really not impressed, probably because I was trying them in P3D (both V3 and V4) where they did not work well at all, I think A2A was just trying to be a bit too trick and they really only work in FSX. A2A's focus these days is just GA aircraft, I don't expect them to update there models any time soon. The aircraft by other makers are much more forward compatible. Last A2A aircraft I tried was the civilian mustang which like WND lasted half an hour. I liked there 377 but again its not forward compatible and has gone out to the mothball yard, although I do recommend there aircraft factory models. San Francisco Bay Area, California. I am serious, and stop calling me Shirley. It's disturbing that two of you canned the A2A Mustang within half an hour. I'd be interested to know what you didn't like. I have tried the A2A models and was really not impressed, probably because I was trying them in P3D (both V3 and V4) where they did not work well at all, I think A2A was just trying to be a bit too trick and they really only work in FSX. A2A's focus these days is just GA aircraft, I don't expect them to update there models any time soon. The aircraft by other makers are much more forward compatible. I'm not sure what "too trick" means - the A2A Mustang isn't compatible with P3D and they never claimed that it was. It's an FSX product, period. Which means that it's not possible to conclude anything about its performance by installing it in P3D - it simply won't work correctly. A2A has announced plans to create P3D-compatible versions of all their warbirds. There are screenshots of their new installer in the development video they posted last week about their Bonanza. Indications are that the Spitfire will be first but they intend to make all of them available for P3D. If they follow their past practices, the P3D versions will be new purchases, and you may or may not be OK with that. But a P3D version would be the only fair test of whether the aircraft works (and how it performs) in P3D. If you want absolute realism, get the WOP3 A2A P-51D for FSX. You won't be disappointed with it. It has that behaviour that will challenge you. If you dont want to go for the ultra realism, the Warbirdsim Mustangs would be a good choice, and you won't be disappointed with it either. Lots of repaints for it. The Realair Spitfire would have been the best choice..get it at Amazon if you can while it's still in stock as Jankees has said. It has both the MKXIV and MkIX. BTW, The A2A Mustang isn't compatiable with P3D, it's only for FSX with Acceleration. Alan_A is correct with what he has said. I forgot to mention that for realism, you have to have the accu-sim for the A2A P-51D for both the mil and civ versions.. If I remember correctly, you only need to buy Accu-Sim once, as it works on both planes. That's right - the only case where an Accu-Sim module covers more than one A2A aircraft product. In my opinion, the choice #1 should be excluded, excepted if you just want a Mustang for doing screenshots and flying without caring about realism, constraints or checklists. So that leaves the choices #2 and #3. Both of them have a high realism and high graphic level, so your choice will depend on what you are really looking for. The A2A aircraft with its Accusim addon will be the most realistic and immersive one, thanks to the unique features brought by the Accusim module. The various aircraft systems are reproduced with a very high degree of fidelity, and this includes almost everything, for each single gauge or aircraft mecanical or electrical organ. The engine is not simply ON or OFF, it is constantly "working" based on various conditions which are handled by the Accusim module. That module also handles the wear and damage of your aircraft, down to the smallest details like the effects of worn out pumps or cylinders. And again, this isn't just working/broken. All various stages of wear are simulated, with precise impact on the behavior of your plane and its engine. And all of this is based on what you do, not just random. The way you use the plane will directly impact its wear. The WarBirdSim Mustangs are the most beautiful Mustang models available today. Contrary to the A2A Mustang, which is limited to just one Mustang D model, the WarbirdSim packages offer various Mustang versions, and each version is modeled in a very precise historic way. A Mustang with a certain repaint will also have all of the physical details of that precise historic plane, including the amount and shapes of external mirrors, shape of the canopy, shape of the antennas etc... The level of visual details will be greater than the A2A planes, and this is also valid for the quality of the textures. Additionally, the plane has a very realistic flight model, and if I remember correctly, it also has a very good quality for the sounds. Finally, this package is also less expensive than the A2A Mustang with Accusim. Here again, the choice #1 can simply be excluded from the start, for the very same reasons as the Mustang above. The choice #3 might be a better and more recent alternative model. Just like the Mustangs, the choices will depend on what level of features and realism you are looking for, and also which model of Spitfire you want. The choices #2 and #3 concern the earliest variants of the Spitfire, while the choice #4 by RealAir is a later variant (long nose). Each choice will immediately reflect accurately in the cockpit and on the plane behavior. The simulation of the various prop types (wooden, two speeds or constant speed) is quite accurate with a very nice video on Youtube from A2A to explain the differences. You also get the appropriate controls in the VC based on the prop you chose. The Dunkirk Spitfire from AH is the most recently released model. It is also a Mk.I if I'm not mistaken. Compared with the A2A, the 3D model is a bit nicer and some textures have a very nice photorealistic effect. The flight model, sounds and graphic features are probably as good as the A2A one, but there are less features. Of course, the price is lower too, so it could be a very good choice based on your budget or the features you are looking for. For information, A2A warbirds work well in P3Dv3, but don't work at all in P3Dv4 (because they are 32 bit...). In P3Dv3 there might be some problems, but I haven't detected them so far... The only one I could spot was the water physics (too much water drag) for the Accusim Cub on floats. From what I've heard, the results in P3Dv3 vary by aircraft - some of them can be jammed in, and some of them (like the P-40), have problems. Haven't tried it myself, though - and I'm P3Dv4 now, so I can't put it on the test. I'll defer to your experience. For what it's worth, i own A2A accusimed Spitfire and flown the AH Spit in Demo modes (which should be fully functional for 15 min). With the AH one you start to miss the accusim stuf right from the start, in flightmodel and sound for example. So nr 3 (JustFlight/AH Dunkirk Spitfire Mk.I) is best to compare with nr 1. (A2A Spitfires (Mk.I and Mk.II) without its Accusim addon). Which are also in the same price range. That is why I love the A2A/Aircraft factory P-51H. I can hop in and fly. I do have Accufeel and that does most of what I want. I'm also only running P3d 1.4 as my sim as it's pretty much 95-99% FSX compatible. As far as Spit's go. I'd be happy if someone could rig up a paint kit for Scrub's new Mk V clipwing over at Simviation. Let's not exagerate though: it takes more or less 30 seconds to start the A2A Mustang with Accusim, and less than that for their Spitfire. Given that your using P3Dv1 and your not a 'systems' flyer I think your choice is sound. A2A/accu-sim is great if you want a study level aircraft and are willing to stay with FSX, but it sounds like you are not. All times are GMT -8. The time now is 12:39.